Has your child ever started off a family vacation day with a grudging go-along, devolving into hand tugging and whining? If planning for children activity stops along the route, then everyone can have a good time in Solvang, California. Perhaps the Solvang attraction ideas below will help. The average child attention span at age five is approximately 15 minutes. In Solvang, during those 15 minutes, it is possible to see a lot and jump between planned child entertainment stops. Even better is these stops are adult-friendly, too. Solvang is two hours by car from Los Angeles, and 45 minutes drive from Santa Barbara airport. Visitors will be 75% Californians, and most of those from Southern California. The peak international visitor surge is in the spring, while California families predominate all summer. The fact that Solvang keeps statistics is important, since it implies the people there want return business. Nearly 60% of visitors questioned were returning, and in the three year period preceding the interview, they had visited 2.5 times on average. Something good is happening to people here for these kinds of visitor numbers. One reason to keep coming back is it is wonderful just getting there. Travel doesn’t have to be tiring along this route because of the pleasant places to stop for a break. Enjoy coastal views and inland rolling hills along the 101 Highway from Los Angeles and Santa Barbara. Once arrived, it is like a cruise ship, because everything necessary is within walking distance of a local hotel. Solvang offers upper-end lodging, a nearby casino, wine touring, and a full range of dining options. The town adopted a Danish theme many years ago, so the place is picturesque and full of custom shops. Tour original Danish bakeries, enjoy treats of all types, and experiment at fifteen plus wine tasting shops. According to the statistics, most visitors spend their money in the town on lodging, meals, and shopping. 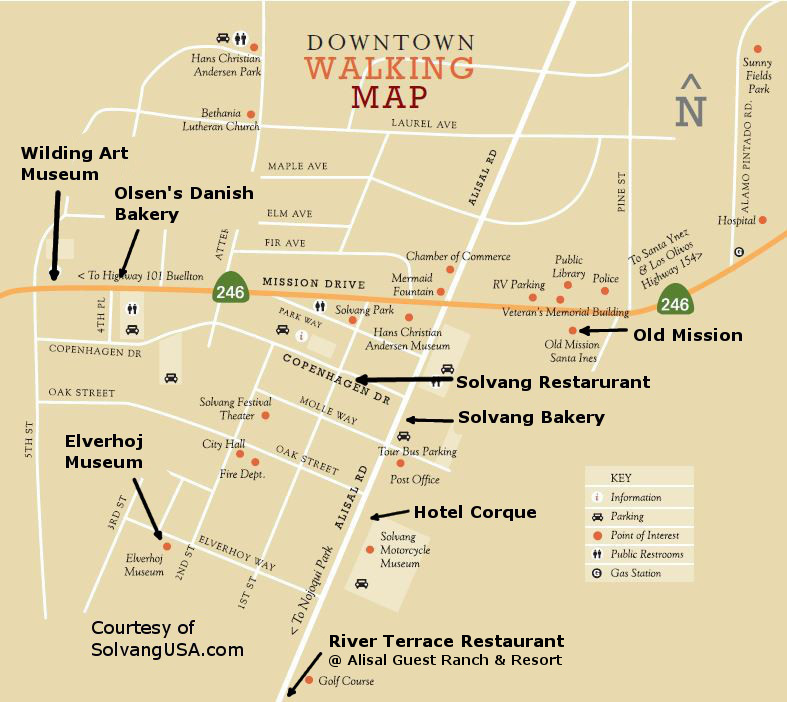 Activities in central Solvang are walkable. Solvang Restaurant is known for its Danish ableskiver breakfast, which to kids is a pancake breakfast. Slip in other day-starters off the menu. Solvang Restaurant is an entertaining short city block from the Hotel Corque. This video link shows what ableskiver cooking is about. Two possible activities follow breakfast. One is walking off breakfast at the California mission Santa Ines and introduce the family to real history from year 1804. There is a gift shop, museum, and a tour of original living quarters. Inside is an active Catholic Church. The view towards the valley and hills is beautiful for photography. 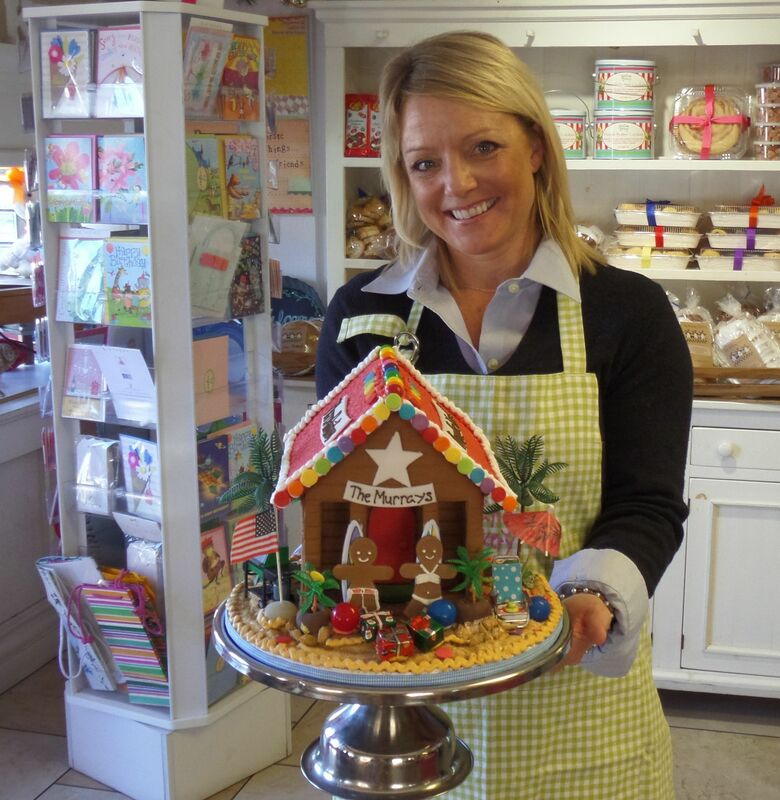 Solvang Bakery lets kids decorate gingerbread cookies or houses. Pastry decorating goes on all year. 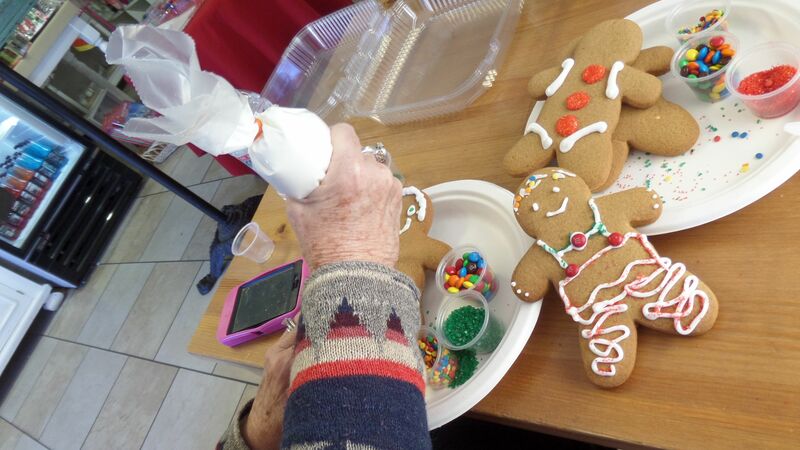 A second possibility is to have fun with the gang, decorating at Solvang Bakery. Buy decorating kits for gingerbread houses or gingerbread cookies. Show kids the basics of decorating with frosting, M&M’s, and sprinkles — but stand back when they take over the decorating bags filled with frosting. They ship holiday decorating kits, but have things all year to decorate for fun. Arrangements in advance are necessary to reserve tables and group parties are especially enjoyable. See here for child activities at Solvang Bakery. Lunch time would now be close at hand, and en route take in the “main drag” action along Mission Drive. At Solvang Park is a bronze statue of Hans Christian Andersen, author of children’s favorites, The Ugly Duckling and Thumbelina. Solvang Park area has bicycles or four-wheeled surrey cycles for rental and route plans for a brief ride around town. Interim entertainment while strolling is at Olsen’s Danish Bakery before stopping for lunch. Here, you can reward children by giving them time before the fun house mirror inside the door. At the same time, survey the delicious offerings. Following lunch, give kids hands-on activity at the nearby Wilding Art Museum. Thoughtfully, they provide work areas for children to color and draw, while parents take a tour of the art museum. The museum offers family art time on the third Wednesday of every month, field activities, and ever changing exhibitions of original art. Recent exhibits include Ansel Adams, Georgia O’Keeffe, Maynard Dixon, Carl Oscar Borg, and more. At the shop, prints can be purchased or special ordered. On the home stretch now, extend the walk through the community towards the Elverhoj Museum. It is full of local history, Danish artifacts, and hand-made decorative furniture in original room themes. Tortilla soup trademark dish at River Terrace on Alisal Road. If deciding to drive the area, a lunch possibility on the Alisal road is the River Terrace Restaurant. It features casual California dining and a stunning view of the hills. This is about one-mile from the main part of Solvang, overlooking the Santa Ynez River and River Course at the Alisal golf course. 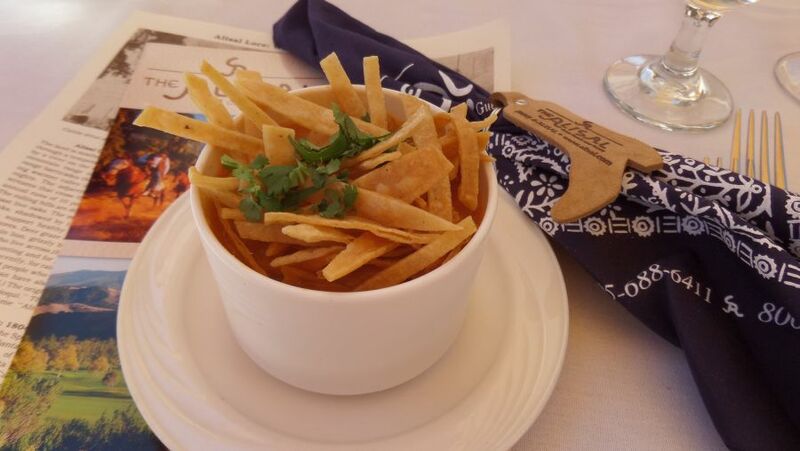 Their Tortilla Soup is a specialty not to be missed. Route 246 offers extensive wine selections for superior foods. Evening meal can be close by at the Route 246 restaurant, next door to the Hotel Corque. Recommended is the Foxen-SMV-Bien Nacido Vineyard 2012 wine, with Texas style wagyu brisket. As a first course, try their house cured meats, cheeses, and pickles tray with Sandhi-SRH Pinot Noir-2012. 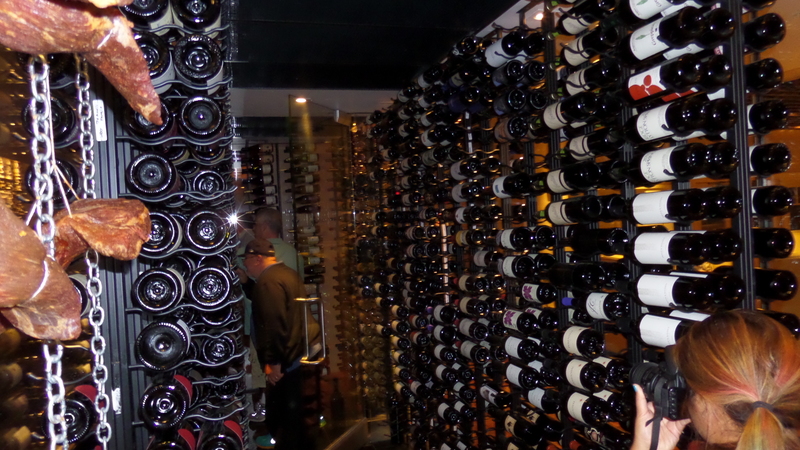 This restaurant has an extensive offering of the best local wines. The Root 246 Restaurant and Hotel Corque are operated by the Chumash Indian Tribe. Their Chumash Casino Resort is available by shuttle bus from the hotel. An excellent family restaurant in Solvang is Cecco Ristorante, located at 475 1st Street. Here, everyone can share the pizza and tasty Italian fare at family prices. Wine tasting in the area is a popular adult activity, as was filmed in the movie Sideways. Wine Tours by Stagecoach Company is a comfortable way to tour wine grapes grown in the region, and the best in wine produced by vintners. Children are not prohibited from visiting a winery, just not at the serving bar. Facilities normally include an outdoor table area, but not a play area. Licensed child care recommended by the Solvang locals is The Little Guest, including infant care and personal nannies. Winey touring for many people begins and ends at the parking lot vineyard view, while walking to the tasting room. Often, these vineyards are for show only, and actual grapes used come from selected vineyards. The broader area is known as Santa Barbara designation, and information about appellations can be obtained at Santa Barbara Vintners. A vineyard known for its special grapes is easily drivable from Solvang. Study the Bien Nacido Vineyards website information about wines using their grapes, soil conditions, and instructional video clips. 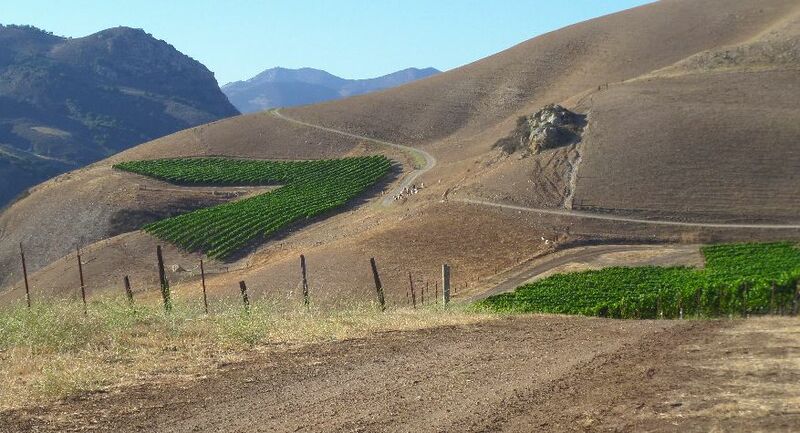 In the photo here, see that growing takes place in selected types of soil and climate conditions, even between hillsides. Once knowing why an area is special, drive there for the scenery and observe how hills extending towards the ocean breeze help cool hot days to make sought-after grapes. Solvang and the surrounding hills are increasingly popular with celebrities escaping to their private ranches. It is easy to reach, and the route along the coast through Malibu offers exceptional beauty all along the highway to and from the Los Angeles area. A great way to break up the drive is to park and take in the beach at numerous public access points. Keep your wine purchases out of the sun, however, because it rarely rains here to spoil a vacation.